Old Hollywood Blvd (photo credit, LA Public Library). 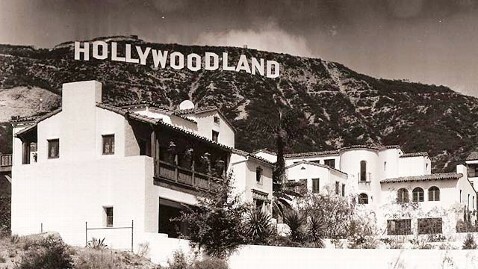 For those of us who know the truth—that Hollywood-type glamour only exists in the movies, the classics that is—the idea of glamorous Hollywood Boulevard still resonates in our minds because of our penchant for romanticizing about the past. Even so, a couple of weeks ago I decided to give Hollywood Boulevard yet another chance; it had been about eight years since the last time I visited there, and the memory of my disillusionment and disappointment when I realized that Hollywood Boulevard was nothing but an overrated, and overcrowded dump, had become a distant memory—enough for me to go there one more time. Perhaps it’s my overall love for L.A., including an appreciation for the movie industry and the realization that Hollywood is still identified as the birthplace of the original movie studios and movie stars, that inspired my forgiving disposition. It certainly helped me surmise that perhaps I never concentrated on the right aspects of Hollywood Boulevard, letting overcrowding, and a plethora of souvenir stores dictate the overall experience and confine my views, rather than direct my focus on the history behind this famed boulevard. 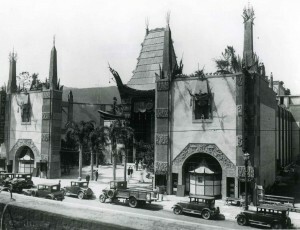 I hoped that with my new perspective, I’d be able to concentrate on some of Hollywood’s original architecture, using those physical aspects of a time long gone to awaken a time that I had never experienced in person, but one that made a significant imprint on my mind as an avid moviegoer and a writer. And so, with this favorable approach I told my children that we were starting our vacation in LA with a visit to Hollywood Boulevard. My 18-year-old daughter thought I was joking, “Are you crazy,” she said, “but it’s completely touristy and ugly; there’s nothing pleasant about Hollywood Boulevard.” Four and a half hours later, we were already standing outside the Hollywood Museum. The woman at reception looked as though she too was a relic from the past, I could tell she was beautiful before she enhanced her looks with plastic surgery. There was the ubiquitous pinched nose and the raised forehead with not one wrinkle in sight, but she was very pleasant and welcoming. The first sign was erected in 1923. The museum is housed in an art deco style building originally purchased by Max Factor, the legendary make-up artist who was responsible for that glamorous beauty style that we love from movies long ago, and also credited for introducing make-up to the masses—the reason why some of us have old black and white photos of family members looking just as glamorous as movie stars of that time period. We were directed towards the first room, which featured the Lucille Ball exhibit; as a long-time fan of “I Love Lucy,” and her radio appearances that I religiously follow on Sirius Classic Radio, I was indeed in heaven. I pointed to the old boxed television set with a black and white episode of “I Love Lucy,” running in the background and explained to my six-year-old son, who looked perplexed, that this was an old-fashioned television set manufactured before I was born! I tried to captivate him with a brief history of the television set but he got bored fast. My daughter, on the other hand, showed an interest in some of the memorabilia and intrigued by new facts she read about Lucille Ball; she had no idea that Lucy was not a real red-head and that Mr. Factor is credited for the red locks as well as the arched lips that epitomize the “Lucy Look.” As a beauty-conscious teen and a lover of the movies, the history of make-up and its use throughout the years, specifically in the movies, captivated her as well. The look of old Hollywood glamour. However, when we continued to wander through the rest of the exhibits, we couldn’t help but feel that everything looked a bit tired, and not as glamorous at it should’ve been. Clothes needed mending; there were loose threads hanging from the hems of dresses, stitching that had become undone, and all the photos and writing could’ve been arranged in a more captivating manner. I thought about London’s Victoria and Albert museum that I had visited a few years before, and the tidy, orderly way in which their collections were displayed. The economic aspect of running a museum is something that I thought about as well, but we’re talking about a museum that represents Hollywood at the end of the day, and still such apathy in my opinion. At the very entrance of the museum they featured a leather dress worn by Angelina Jolie, probably what the museum curators feel represents 21 century glamour, but it too looked a bit shabby in its ugly glass display, with stitching coming apart through its front seam. As hard as we tried, it was almost impossible to get into that nostalgic mind-frame that I hoped would captivate all of us. At the end of the day, everyone, regardless of age, has a favorite movie but that alone was just not enough. I freely admit that I’m similar to one of Woody Allen’s characters, Gil Pender, in the movie Midnight in Paris—the man who admired The Roaring Twenties. I often think of how things used to be as opposed to how they are today. Sure, one cannot compare the advancements that we’ve made in the past 100 years in almost every aspect of life, and how we’ve bettered our lives in that respect, but it’s the little things that I yearn for, even though I had never experienced them for myself. 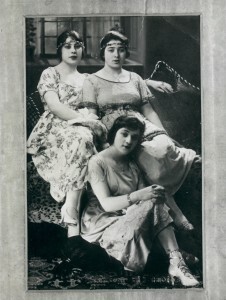 I often wonder what it was like to live at a time where the streets were less crowded, clothing was elegant, hairdos were spectacular, beauty was natural (more so than today), cars were beautifully designed, imaginative, curvaceous and unique. It was a time when people would greet each other on the street, perhaps stop to chat, and there was still room for the eclectic little mom and pop stores lining every boulevard and complimenting the occasional elegant department store. A time where things were still exciting, and in terms of the movies, it’s when filmmakers were beginning to discover the advantages of working on the West Coast because of great weather, wonderful open spaces without fear of being bound to Thomas Edison’s motion picture patent. In those days, independent movie makers were often sued by Edison who owned most of the patents for movie production, so by opting to film a distance away from the East Coast, it bought them just enough time to complete production and avoid Edison’s monopoly of the industry. In 1910 D. W. Griffin filmed the first movie ever shot in Hollywood titled “In Old California,” a film that opened the doors to many other movie makers and turned Hollywood into the iconic movie capital of the world. But one would have to be truly nostalgic, and have some sort of emotional connection to that time in movie-making history in order to awaken those types of memories, because the museum’s shabby displays sure didn’t do it for me. The Walk of Fame where my son recognized one of his favorites. 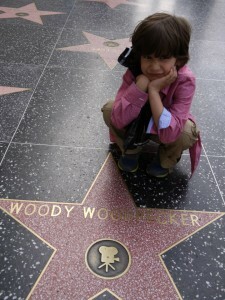 Next, we strolled along the Walk of Fame in order to take a closer look at the theaters dotted along the way, and possibly get a bite to eat at the famous Musso & Frank Grill, a restaurant that represents some of that Golden Age Hollywood history. We tried to hang around the Boulevard, but it was such a let-down from the moment we were hounded by a freaky looking man, a Johnny Depp lookalike dressed as Captain Jack Sparrow. I guess that walking around with a six-year-old automatically attracted those wannabes directly to us, thinking that I would quickly shell out money to have them pose next to my son. I was amazed by the countless numbers of tourists happily getting their photo taken with those second-rate, shabby characters. They were all dirty, vulgar, and their costumes made a sham of the characters they portrayed, and as an added bonus we overheard one of those disheveled actors talking to a tourist who asked if the photo opportunity was free, “I’m Jewish, so of course I charge for a photo,” he responded with such gall. If it were legal to punch an idiot on the street then I would’ve done so right then and there. This only enhanced the feeling of pure disgust with the people surrounding us and polluting a place that still represents the heartbeat of the movie industry; people from all over the world go there to get a glimpse of their dreams. But today, it’s nothing more than a place that used to represent glamour and fantasy. I lost my appetite, even for Musso & Frank’s place, and turned around on the spot and left for the beach. I could go on and write about the way it used to be in Venice Beach, and the beach glamour that surrounded the area years ago, but I think that I’ve said enough for one day. My husband’s glamorous grandmother Jenny (bottom), 1910.